Texas’ New Senator Ted Cruz Tells It Like It Is! What a joy it has been to watch Texas’ newest Senator Ted Cruz in action! In the short time he has been serving in Washington, he has already become a strong voice on the Hill and made an enormous impact for the conservative values that we hold so dear. 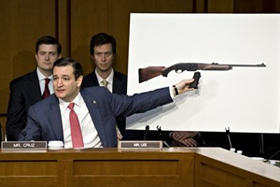 Earlier in the week, Senator Cruz held nothing back during the Gun Control Hearings and pointed out the tendency of Washington to let emotion drive policy-making off the rails and operate in a “fact-free zone.” The Senator was unrelenting on protecting the Constitutional rights of law-abiding citizens. He pointed out the bad policies of a Congress seeking to restrict the liberties of law-abiding citizens rather than focusing on the violent criminals who should be targeted. The Senator went on to lay out the irony of how a small, non-functional piece of plastic is the only difference between a legal and an illegal firearm - according to Sen. Feinstein’s proposed ban on assault weapons. On a recent trip to Washington, D.C., I had the great privilege of visiting with the Senator. Although many of us worked diligently on his campaign and simply know him as Ted, I took great pleasure in finally being able to address him as Senator Cruz! I look forward to many years of watching him stand strong for our Constitution and the future of Texas. 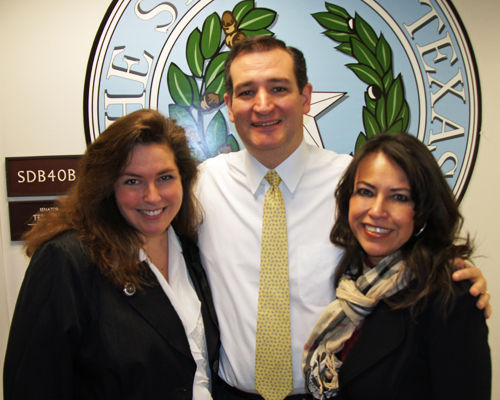 Susan Fletcher, Senator Ted Cruz and Adryana Boyne visit in Senator Cruz’ Washington, D.C. office during a recent trip.